Robert Redford is no stranger to being involved with projects that explore the American West (“The Horse Whisperer,” “Jeremiah Johnson”) or the hardships of prison life (“Brubaker,” “The Last Castle”). It’s no wonder then that the Hollywood icon, under the title of “executive producer,” is prominently featured for the new prison drama, “The Mustang.” It makes perfect sense as a means to market the film, but this occasionally emotional story proves to have legs strong enough, thanks to its lead actor, to not need Redford’s name as a carrot. In a powerful, career-defining performance, Belgian actor Matthias Schoenaerts (“Far from the Madding Crowd”) plays Roman Coleman, a convict in a rural Nevada prison who prefers solitary confinement over being with the general population. Roman admittedly does not play well with others as his inner rage often gets the best of him. A caring psychologist (a drastically underused Connie Britton) sees him as a challenge and decides to give him a second chance, whether he likes it or not, by providing him a rare opportunity to rehabilitate. Roman finds himself thrust into a program in which wild mustangs are saddle broke and then sold, something that’s currently done in real life at several prisons throughout the West. A grizzled horse trainer named Myles (“shockingly” played with grit by Bruce Dern) offers Roman a deal to move up from being a manure shoveler to a trainer. The catch is that Roman must stay in the ring with a mustang that’s as seemingly untamable as Roman. It’s a tall order yet the outcome is predictable. Despite guidance from a veteran, horse training prisoner (Jason Mitchell, “Straight Outta Compton”), Roman’s achievement is short-lived as his temper rears its ugly head and he treats his mustang as a punching bag. Back to solitary Roman goes while at the same time his estranged, pregnant daughter is trying to get him to sign over some property so she can use it to start a new life. A storm as fierce as Roman and his mustang unexpectedly rolls in, giving Roman a second chance at redemption, but as expected, nothing comes easy in this tale. As the first, feature-length film by Laure de Clermont-Tonnerre (“Rabbit”), “The Mustang” captures the essence of the Western landscape and the power, and even grace of the wild horses who populate it. It also presents an all-too brief glimpse at a prison system that in general has no intention of rehabilitating criminals. It’s only rare exceptions like the mustang program that a chance is given, but those seem to be skating on thin ice as they are poorly funded and snickered at. Schoenaerts is a revelation. His performance is fueled with tangible fury against the world and himself. It covers a pain he gradually comes to face and Schoenaerts fleshes it out with nothing short of perfection. However, Clermont-Tonnerre beats us over the head with the whole, Roman-and-the-horse-are-reflections-of-each-other thing. Events within the story are also often foreseeable so don’t expect any genuine surprises or originality where that’s concerned. 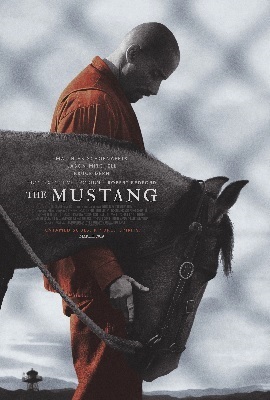 In the end, “The Mustang” is worth the ride because of Schoenaerts’s performance alone.